We all awakened bright and early Sunday morning ready for another one of our adventures. 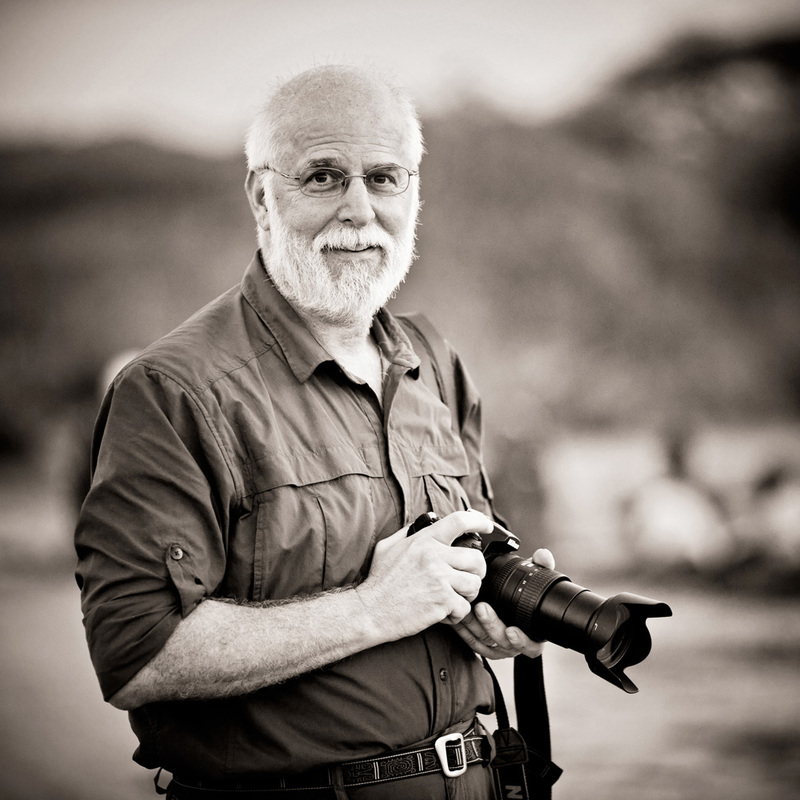 We were to pick up Sokoine and Angel down at the bottom of the FAME road on the tarmac at 6:30 am with plans to make it to the Ngorongoro Gate shortly after it opened that morning. 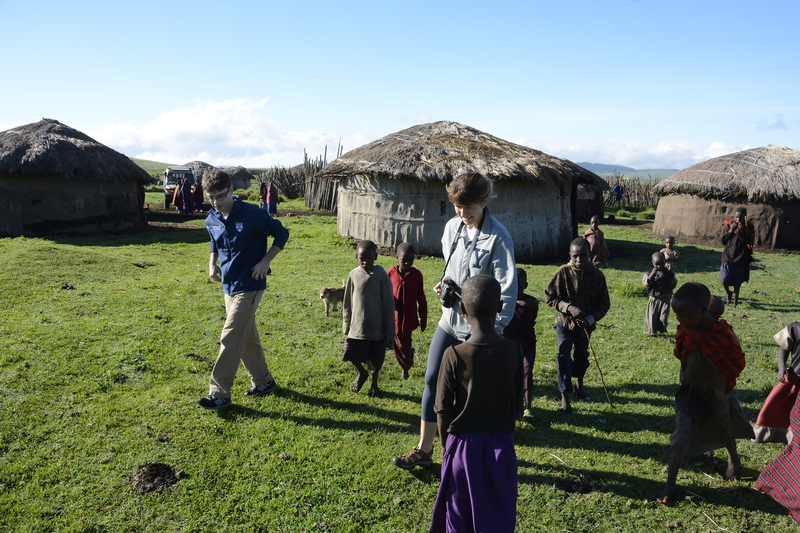 Chris, Jamie, Nan, Glen, Abbey (a pediatric NP from Philadelphia who arrived here last Friday), Angel, Sokoine and myself were all traveling to the Ngorongoro Conservation Area (NCA) to visit Sokoine’s boma and to hike into Empakai Crater. 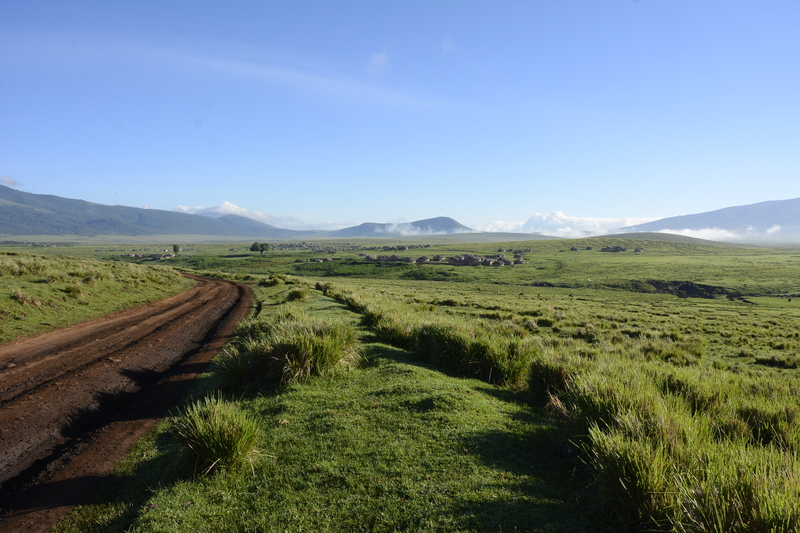 Visiting the NCA means passing through the Ngorongoro Gate, which in the past, has, on several occasions, posed a major obstacle for us due to the administrative red tape and bureaucracy that occurs there. Only for the NCA do you need to put money in the national bank in the exact amount necessary for which they will give you a receipt which is then brought to the gate. Last October we were off a few dollars and had to wait until the supervisor would let us pass and then we had to drive to the main NCA office on the rim to pay an additional amount and which probably cost us a total of two hours delay. Back in March 2015, we were on our way to a safari in the Crater on the most beautiful day you could imagine when, only a few kilometers into the park, my Land Rover suddenly lost it’s forward momentum going uphill and we were stuck only to find out later that our clutch plate had totally disintegrated requiring a tow back to town. When we stopped at the gate being towed out, they told us we couldn’t have our money back as we had already entered the NCA, but they would allow us to come back the following day and do the safari for no charge. Unfortunately, we were flying out the following day and were unable to do that so we all lost the money we had paid for our entrance into the NCA and to the Crater. With the new administration of Magufuli, though, there seems to be a new process that entailed the same filling out of paperwork and depositing money to the bank, but when we arrived at the gate, it took us probably 5 minutes to finish the process there and be on our way. I have never been through the gate in such an incredibly fast time and was sure that they were going to find some reason to delay us there. Miraculously, they didn’t and we were on our way in short order, though I was constantly looking in my mirrors as I was sure that we had done something wrong and they were going to be chasing after us at any moment. The weather wasn’t horrible, but it also wasn’t clear at all and it kept drizzling on the windshield on our way up to the crater rim where the weather can be downright nasty in the morning since you’re up in the clouds. The drive to the crater rim is through a forest that can best be described as primordial, with tall trees and hanging vines that look straight out of Jurassic Park. The road winds steeply up and up with steeper drop offs into the canyons that exist on this side of the rim. Around each turn you clearly expect to see a tyrannosaurus rex standing in the road. We finally reach the crater rim where there is a lookout to view this spectacular geologic feature, but we are totally socked in the clouds and that will have to wait for our drive home when hopefully the weather will have improved. The Ngorongoro Crater is the world’s largest completely intact volcanic caldera (it is 20 km across!) and is home to an incredible assortment of animals that don’t migrate out of the crater along with a large number of the rare black rhinos. As we travel counterclockwise around the rim (the opposite direction than if you were heading to the Serengeti), the forest remains lush and green and then suddenly, the skies open up to reveal a wonderfully blue sky accented with the wispy clouds that are slowly dissipating along with the angle of the sun. This is common weather at the rim, where, at over 8000 feet, the clouds roll over the rim either into or out of the crater depending on whether it’s morning or evening. 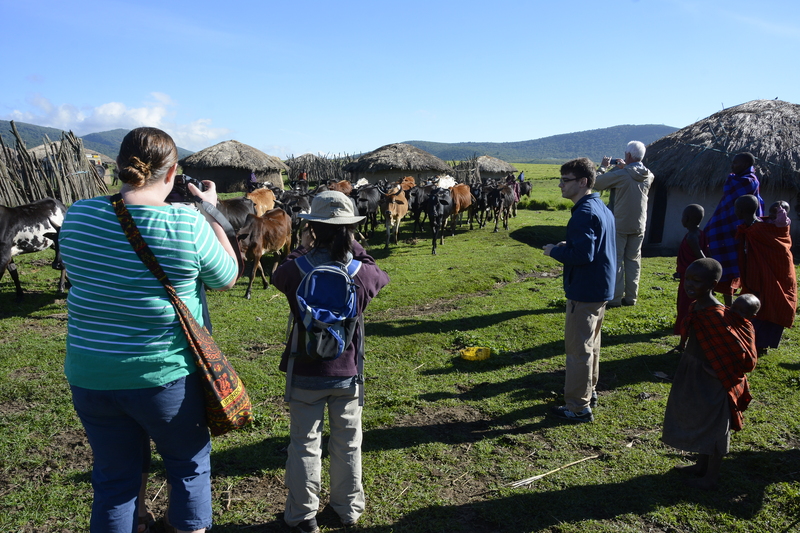 We eventually come to the two-way road down to the crater floor, but that is not our destination today and we turn away into the Ngorongoro Highlands that sit at the same altitude and is home to many, many Maasai boma, the traditional homes of the Maasai comprised of a grouping of round huts covered with grass roofs and cow dung walls and typically enclosed with a brush fence. 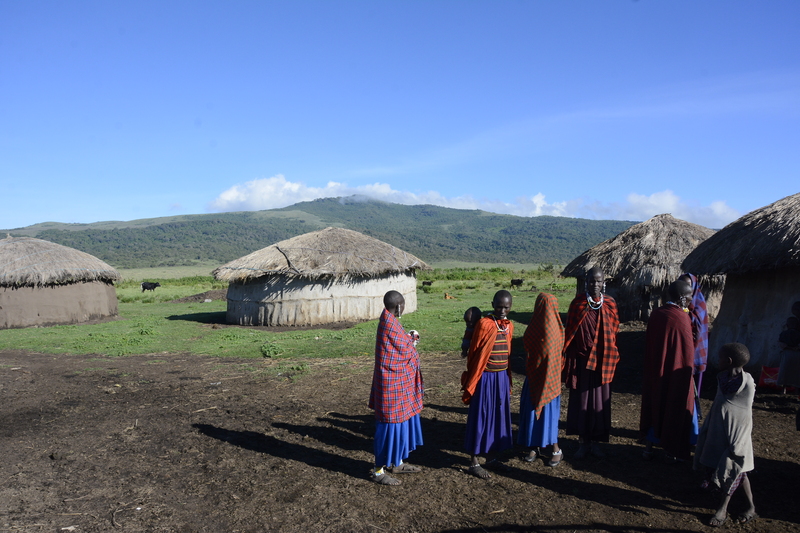 Each boma is home to a single family that is made up of a husband, his multiple wives and all of their children. Animals are held in small circular corrals that sit at the center of the boma most typically. 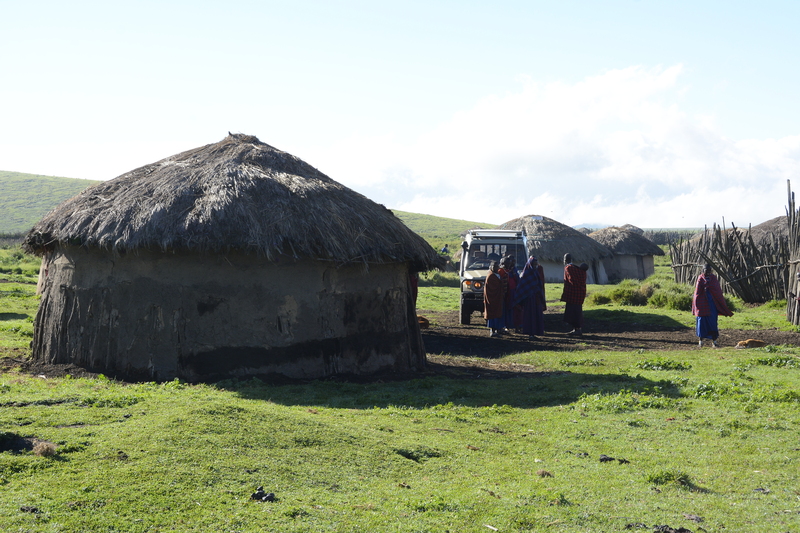 The lush green grasses that are present now will sustain a large number of families so that the area here is filled with bomas. 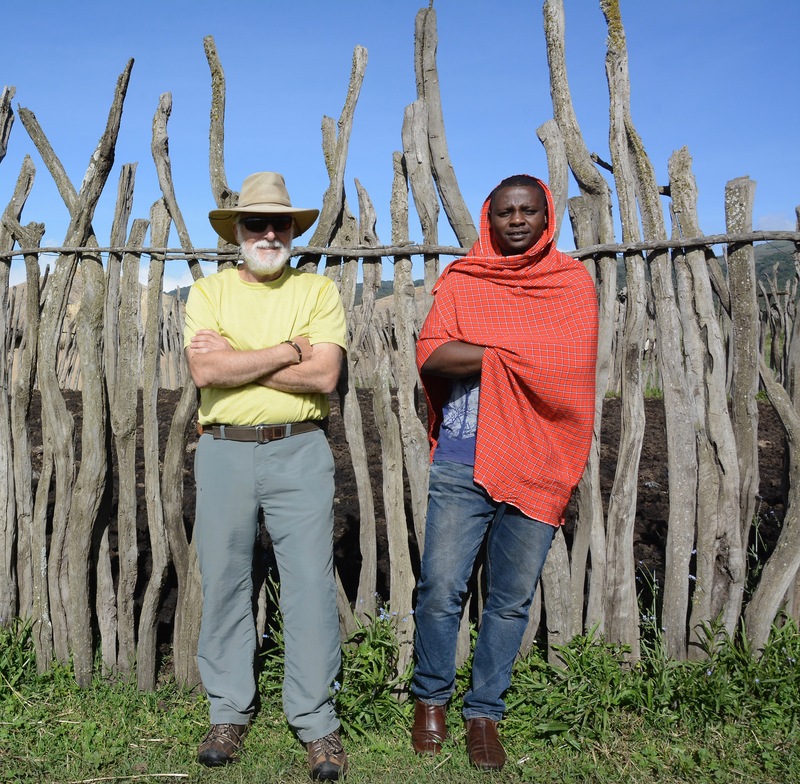 Our plan for the day is to visit Sokoine’s father’s boma, where he was born and raised and where he attended primary and secondary school prior to leaving for college. 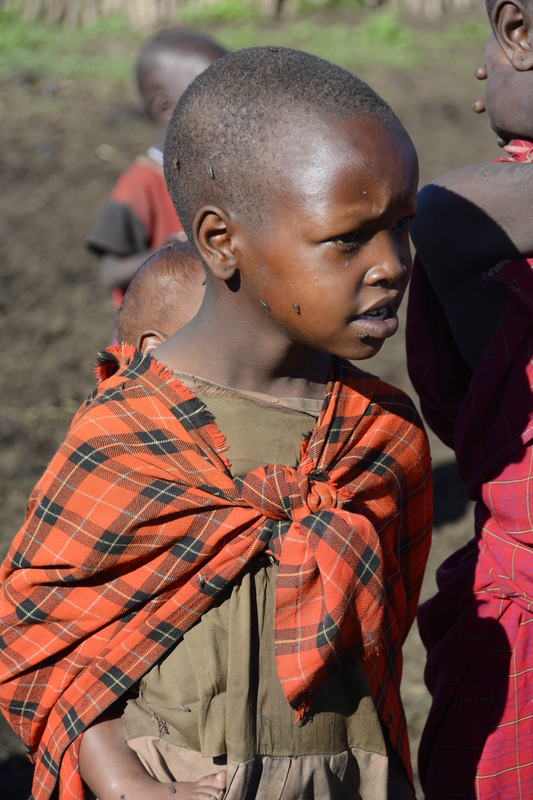 Sokoine’s father is a very successful Maasai with many, many cattle, five wives and lots of children and grandchildren. Their boma sits in the middle of the fertile valley that flows west from Ngorongoro Crater in the direction towards Empakai Crater (our final destination), Ol Doinyo Lengai (“Mountain of God” to the Maasai and a fantastic volcanic cone that is still active) and eventually leading up to Lake Natron on the Kenya border. 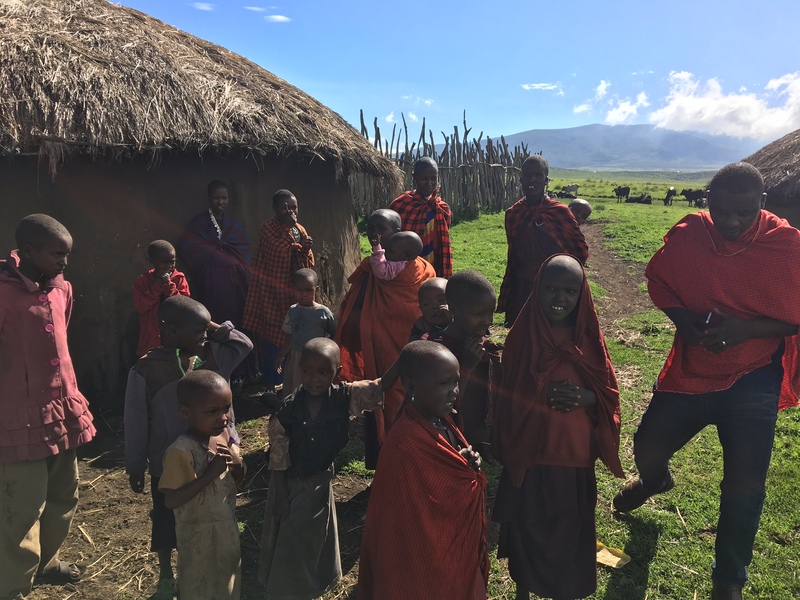 We turn off of the main road onto a small trail of tire tracks and after a short distance arrive at their boma which is made of up of many huts and animal enclosures as several of Sokoine’s brothers also still live here with their families. 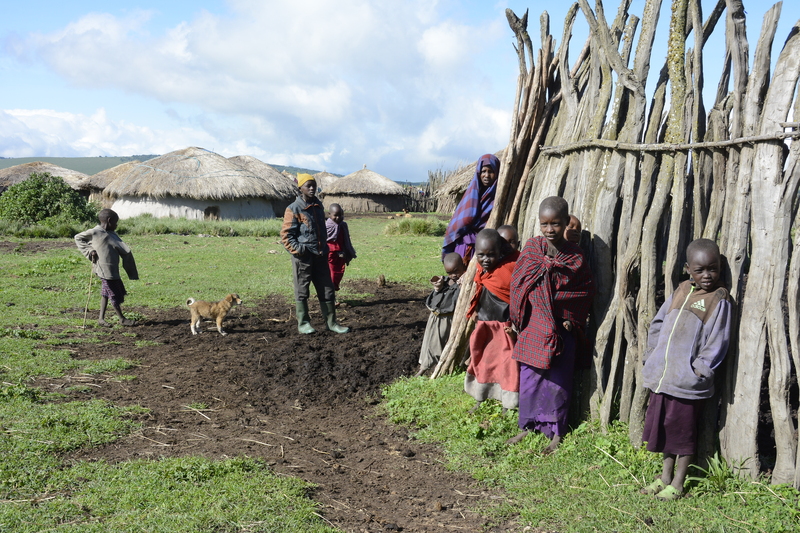 In this area where there are numerous bomas, each is not surrounded by an enclosing barrier that you see in other less fertile areas which I suspect is due to the fact that these are actually small communities unlike the lone bomas you would see elsewhere. 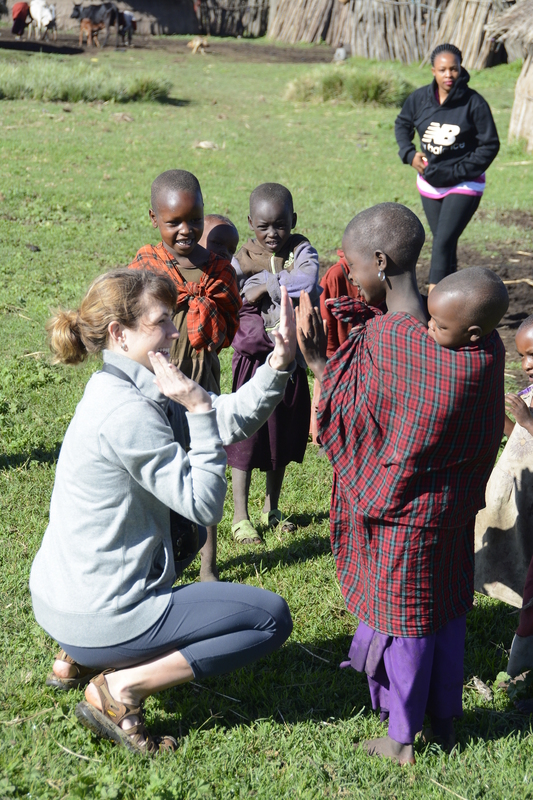 As soon as we arrive to the boma, everyone is out to greet us and there are many, many young children all fascinated by the wazungu (white people) who have come to visit them as this would be a very exciting event. This area of the highlands is probably visited by far less than 1% of the visitors who come to Tanzania to see the wildlife. 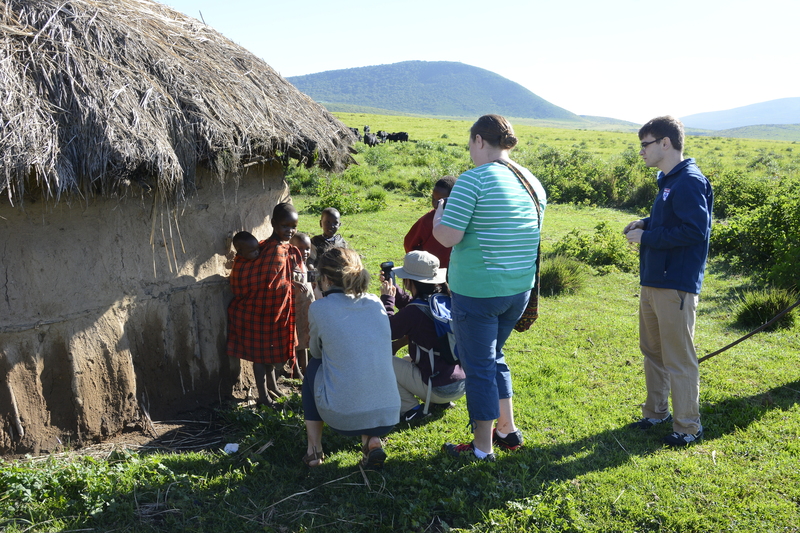 We had stopped at a boma a short distance from the top of the two-way road when we had visited here in 2009, a “cultural visit” to the Maasai which is what most safari companies offer and is the typical view that westerners see of the Maasai here. 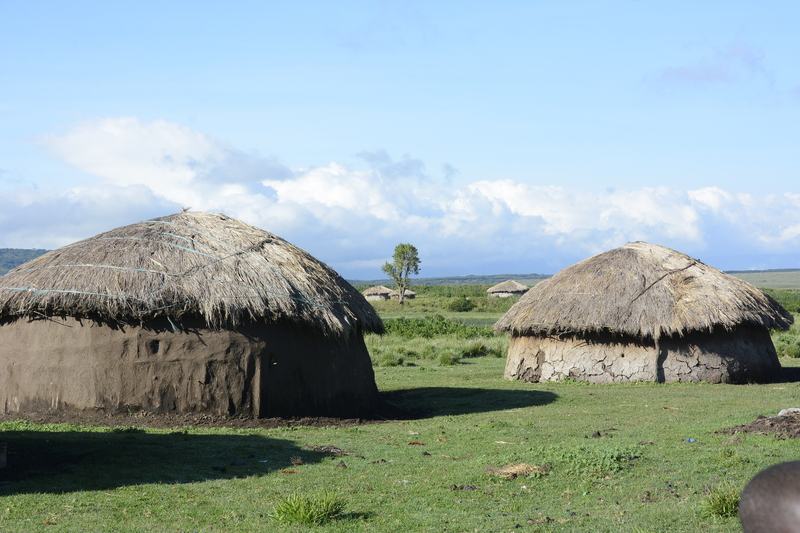 These are bomas that are paid to have people come visit and though it is certainly a reasonable peek at their life, it is nothing like visiting a friend’s boma which can only be done when you’ve been here for some time. We are not here as visitors, but rather as friends of Sokoine and are therefore greeted as such and are honored guests. I had given Sokoine money to buy his father some gifts for our visit which is the tradition here as it is elsewhere, though the gifts may be a bit different than at home. 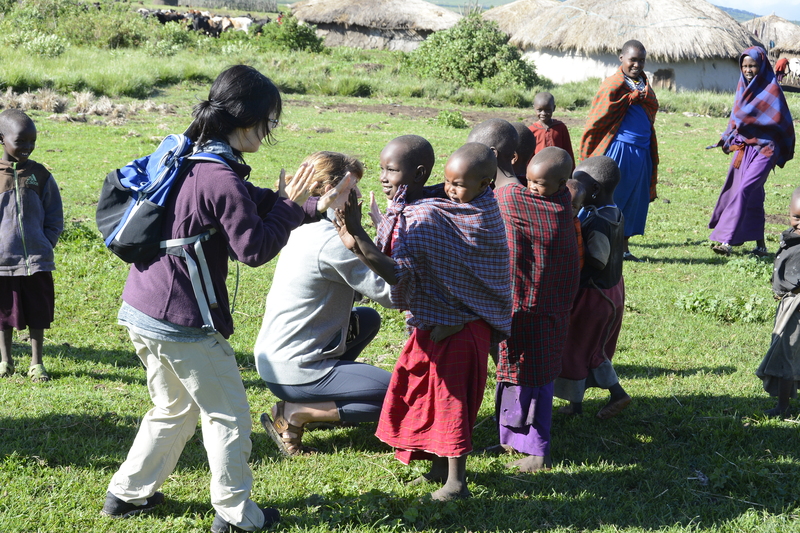 We are bringing 10 kg of rice, sugar, black tea, and dip and medicine for the cattle. We immediately walk off to greet his father, who was sitting a short distance away surrounded by several of his grandchildren. One of them was holding a baby goat who was so cute that I couldn’t help but take him from the child, only to discover that he was bleeding profusely from his ear as they were in the process of marking him, or cutting a small hole to identify it as belonging to their boma. So after realizing that I had blood dripping on my arm and thankfully not all over my clothes, probably a bit longer than it would have taken most to realize this or more likely they wouldn’t have impulsively taken the goat in the first place, I handed it back to the boy so that Sokoine’s father could finish the job of marking him with a very sharp knife over the loud objections of the poor little goat. We eventually walked over to our vehicle to take out the gifts and present them to his father. 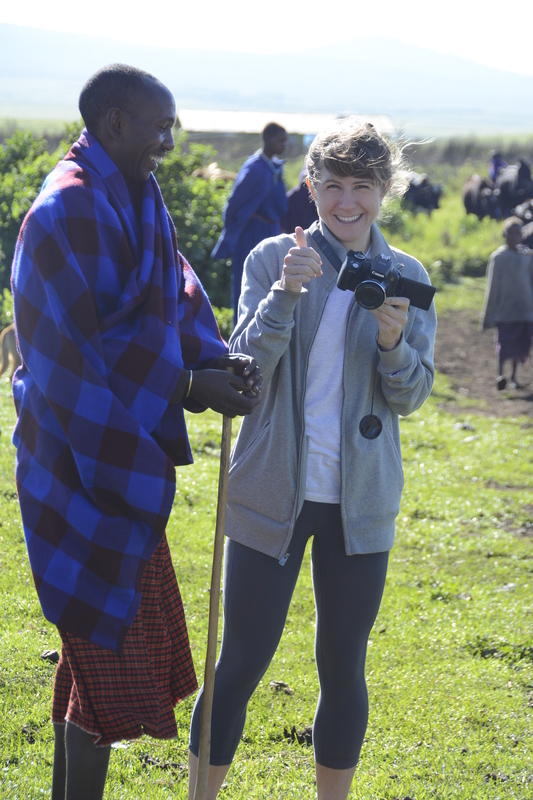 I have said before that the Maasai are very understated in their emotions so the thank you from his father was very brief but heartfelt as he instructed his youngest wife to heft the huge bag of gifts and carry it off to her hut or wherever they were planning to store it. Sokoine had also bought a bag of candy for us to distribute to the children and the minute he handed the bag to me I was immediately surrounded by dozens of children with their hands extended. It was impossible to tell who had already gotten some candy and I’m sure that many of them were getting seconds and thirds, but their cries were too much to resist so I just kept handing them out. After a while, though, I handed the bag to Angel to finish the job of distributing them so I could walk with Sokoine and his father. Knowing of Sokoine’s accomplishments and where he is today, I could not help but think of him twenty years earlier having been one of these young children dressed in shukas in bare feet, many of them carrying their younger siblings on their backs. What a stark contrast to come from the boma and achieve what he has, but then I must realize that I am using my western standards to make this comparison and it is not the goal of every Maasai to leave the boma life, but rather only a few, for his father is a very successful man and this is certainly what he has chosen for his life. 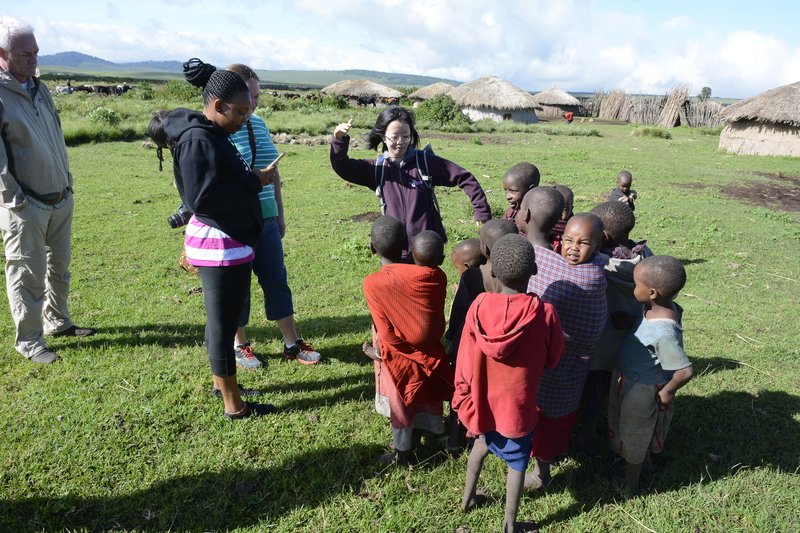 We spent a good amount of time with his family at the boma and mostly all the lovely children who were schooled in the tactics of tag and taught how to play patty-cake by Nan and Jamie quite expertly. We were able to watch all the cattle being herded through the boma on their way back to their enclosures or nearby so they could be milked by the women, squirting directly into their calabashes to be fed later directly to the babies. We had delicious “chai” which in the boma is black tea boiled directly with fresh milk and sugar. It is an amazing beverage and was appreciated by all. 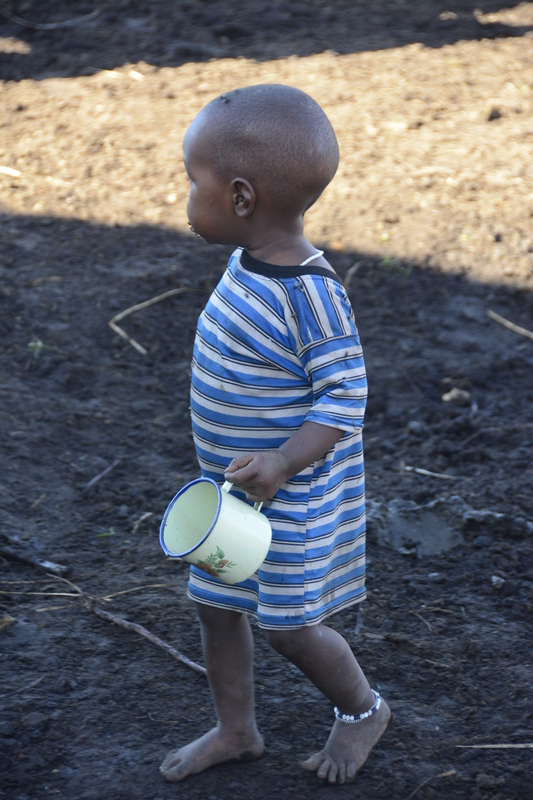 Later, I walked with Sokoine to visit his older brother who is a veterinarian and was visiting the boma to tend to their cattle. I watched as they had a large bull on the ground with its legs lashed and who was being neutered in an extremely humane manor of just disrupting the vasculature and other structures traveling to the testes with a large clamp device. 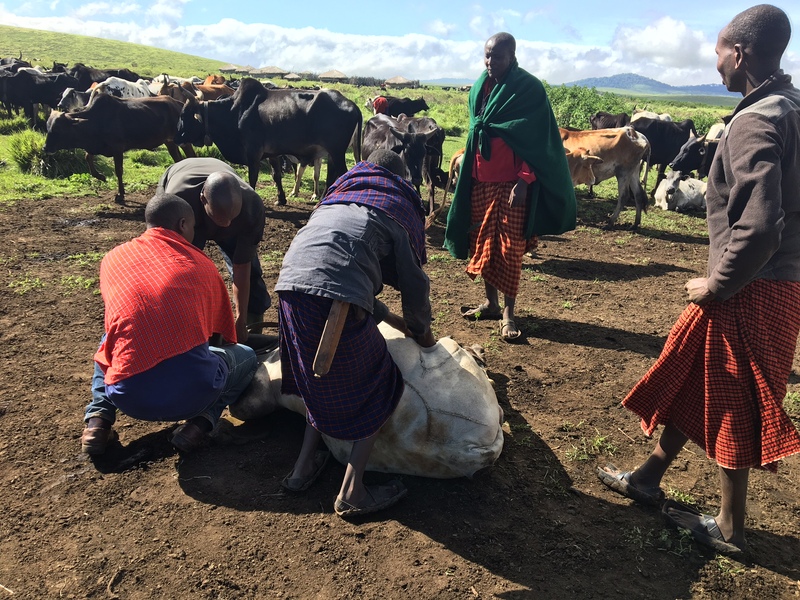 His brother had left the boma as well to become a veterinarian, but returns to care for the bomas cattle, many of which are his as his father has actually distributed them already to all of his sons. Sokoine’s mother wasn’t in the boma as she is currently living near Oldupai Gorge and tending to their sheep and goats who are grazing there. 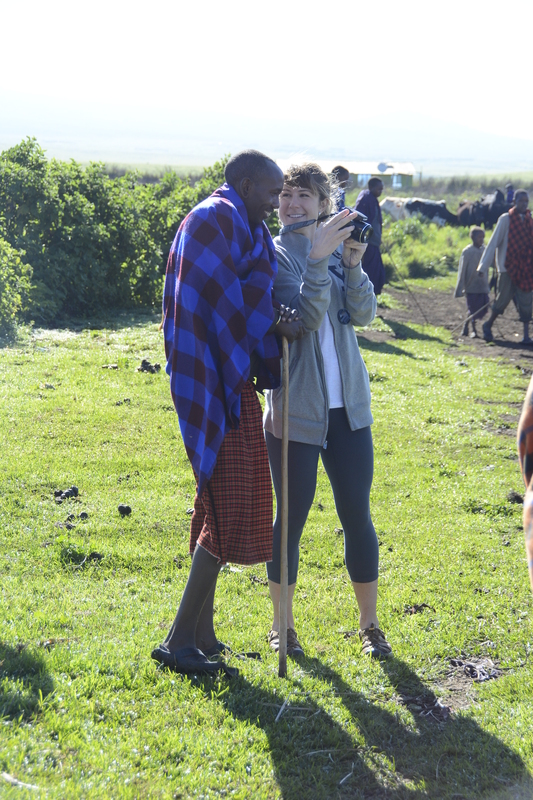 I think we all left the boma with a new sense of the Maasai culture, certainly the residents who hadn’t visited a boma yet we’ve been treating these lovely people at FAME for the last weeks. Even I, who has visited Sokoine’s family before as well as several other bomas, find that each time there is a new sense of familiarity and greater awe for this proud and wonderful tribe who continue to persevere in their simple and ancient lifestyle, yet provide the opportunities for those individuals such as Sokoine and his brother, who despite their lives outside the boma, have remained connected.